So far, I described communication between neurons in an intuitive manner. You touch an object, a signal sweeps across the neuron's axon, and neurotransmitters are released into the synapse. The idea that something can move from one location to another (a car, a train, a wave moving toward the shore) is familiar. So it's intuitive to imagine neuronal signals carrying touch information from the hand to the brain. Regardless of whether the neuron is carrying a signal about something you touched, heard, smelled, or thought, the signal could not possibly move along the axon if the entire neuron were not bathed in fluid. 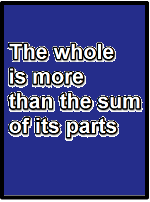 That's because the signal involves a substance moving in and out of the neuron, and the fluid allows things to flow in and out. This is where neural communication becomes a little less intuitive. 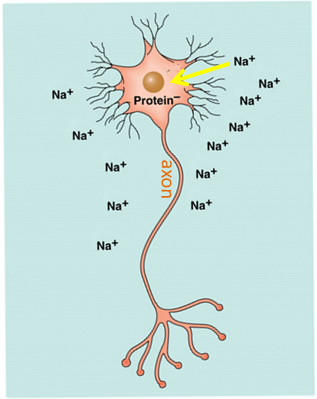 The neuron is surrounded by fluid that contains sodium, abbreviated Na+. Neural communication begins when gates within the wall of the neuron open, allowing sodium to flow in. The gates first open in the neuron's cell body (above), and then at the beginning portion of the axon (below). Wherever the sodium gates open, sodium flows into the neuron. Next, gates open further along the axon. The entry of sodium at each point along the axon is what triggers the opening of the next gate along the axon. 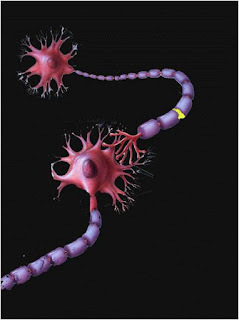 The sodium gates open one after another, like dominoes, until finally the gates open at the axon terminal, where sodium (and other substances) enter the neuron, causing the release of neurotransmitter (depicted as little green spheres). The neurotransmitter will then cross the small synaptic gap between this neuron and its neighboring neuron. When the neurotransmitter binds to receptors on the cell body and dendrites of the neighbor, sodium channels will open in that neuron, and the "signal" (sodium entry) will move down that axon. 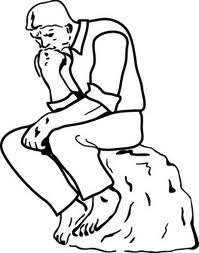 When sodium gates open, why does sodium enter the neuron? The fact that a gate opens doesn't mean you have to walk through. 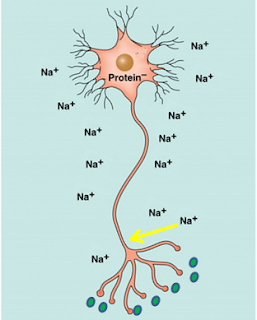 Sodium enters the neuron for two reasons. 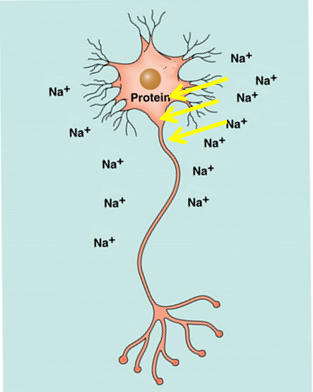 First, there is much more sodium outside compared to inside the neuron. When something is more concentrated on one side of a barrier, it moves to the less concentrated side if it can. 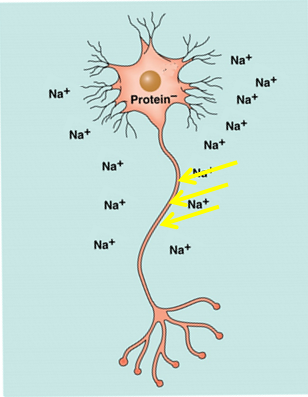 As soon as a sodium gate opens, sodium can cross to the inside of the neuron where sodium is less concentrated. The second reason sodium enters the neuron is because sodium has a positive charge. The inside of the neuron is full of big negatively charged proteins. Things with opposite charges attract. So when the sodium gate opens, sodium moves inside to where it's more negatively charged. The negatively-charged proteins might instead have exited the neuron to approach the positively charged sodium-rich exterior, but the proteins are much too big to fit through the wall (membrane) surrounding the neuron. The proteins are stuck inside, so the little sodium ions enter (an 'ion' is what you call an atom with a charge). Below is a diagram depicting the inside of the neuron (intracellular space), the outside of the neuron (extracellular space), and the membrane that separates them (depicted as a double layer of brownish circles). 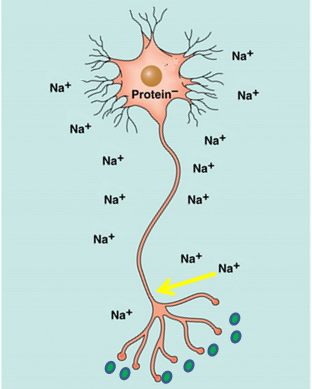 The little red circles concentrated outside the neuron represent the sodium ions. The green opening to the right represents the sodium gate. It's normally closed, but when it opens sodium enters. The membrane of the neuron is chock full of these sodium gates which open one after another. 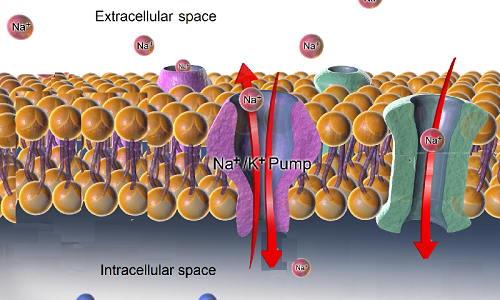 We haven't talked about the sodium/potassium pump (Na+/K+ pump, depicted in purple). But as you can imagine, when sodium enters the neuron in a domino-like sequence as described above, the inside of the neuron becomes full of sodium. The sodium needs to be moved back to the exterior of the neuron in order for the sodium gates to begin their domino-like cascade once again. That's what the sodium/potassium pump does -- it expends energy to move sodium back to the outside of the neuron. Potassium (K+) also plays a role in neural communication, but I'm leaving aside its role in the story. So, while it's easy to imagine a neural signal carrying touch and other information to the brain, the nature of this signal --- the sequential opening of sodium gates along the neuronal membrane --- is harder to picture. Still, this is how most of our hundreds of billions of neurons pass signals from one to another. How can this kind of thing give rise to sensory experience, thoughts, memories and the rest?